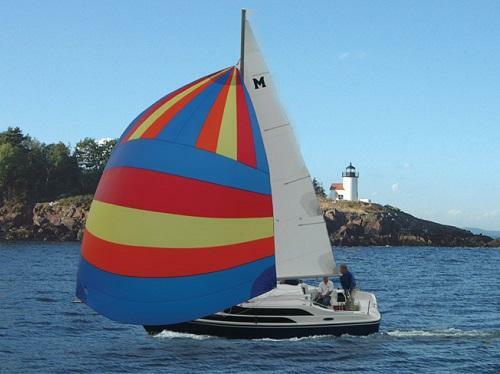 Merriam-Webster defines a spinnaker as “a large triangular sail on a boat that is used when the wind is blowing from behind.” A spinnaker is a special type of sail designed specifically for sailing with the wind 90 to 180 degrees off the bow. When it fills with wind the spinnaker balloons out in front of the boat. It is constructed of lightweight fabric, usually nylon, and may be optimised for a particular range of wind angles by shaping of the panels and seams. The spinnaker is often called a kite, or a chute, because it resembles a parachute in both construction and appearance. The story behind the sails dates back to Spinnaker founder and owner Ken Taylor’s youth when he was passionate about sailing out of the Royal Canadian Yacht Club (RCYC) on the shores of Lake Ontario. The name Spinnaker was chosen because sailing and boating related well to Hilton Head Island and reminded Ken of his days sailing and racing back in Toronto. Sailing is very much a part of the fabric of coastal life. It represents the many sporting and leisure activities that can be enjoyed on an island. The spinnaker sail is the largest type of sail and is used in racing – a sailboat is fastest when using this sail. It’s also the most beautiful sail – typically very colourful and decorative when filled with wind. In essence, the spinnaker sail is an embodiment of speed, power and beauty. Mr. Taylor continues to share this passion for sailing with his children and grandchildren during summers north of Toronto. His career began in Toronto where he worked in Finance for Ford Motor Company. After years of living and doing business in the Southern United States, Mr. Taylor understood the growth opportunity of this market. He became involved in several Hilton Head Island developments, specifically in Sea Pines Plantation. The entire family vacationed on Hilton Head in the late 70s as resort development commenced. Hilton Head’s appeal for the family was the many activities it offered: ocean and beach activities, tennis, cycling, inline skating and golf, all in a beautifully natural environment. After these initial family visits, Spinnaker Resorts was founded in 1982 and continues to develop within the vacation industry. Joan Taylor acquired her passion for building and design as she watched her father James Towers, an architect, design commercial financial institutions across Canada for the Bank of Nova Scotia. Mrs. Taylor pursued her 2nd career, interior design, and combines her talents with Mr. Taylor to power Spinnaker’s vision today. Spinnaker Resorts develops, markets, sells and provides property management for resorts on Hilton Head Island, South Carolina; in Branson, Missouri; and in Ormond Beach, Florida. The corporate headquarters are on Hilton Head Island where Spinnaker developed its first timeshare project in 1983. It expanded to Beaver Creek, Colorado in 1989; Branson, Missouri in 1998, and Ormond Beach, Florida in 1999. Southwind Management Corporation (SMC) was created in 1993 and currently manages 969 timeshare units, as well as the S.R Hotel on Hilton Head Island. Spinnaker’s distinctive architecture, state-of-the-art swimming pool areas, extensive health and fitness facilities combined with SMCs comprehensive recreational programs and excellent personal service are among the hallmark features that contribute to an overall extraordinary resort experience. For more about the Spinnaker Resorts history, visit our website.